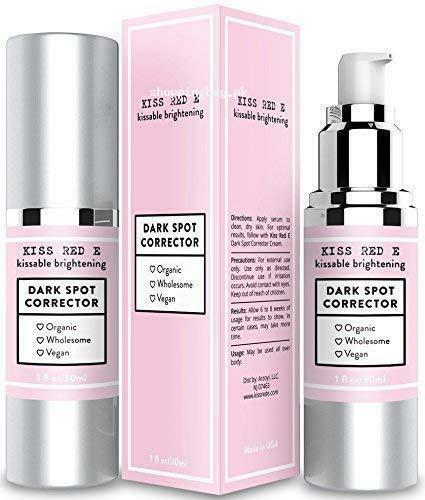 USA imported and original KissRedE Dark Spot corrector has the magical blend of botanical extracts, such as green tea extract, hyaluronic acid, etc. The formula can replenish the skin and make it glowing and youthful. It also reduces the aging signs, dark spots, fine lines, etc. You can get the ultimate brightening serum from Amazon face serums online shopping in Pakistan. Strike on order now and get it at your locale with cash on delivery facility. Legal Disclaimer: The product statements on this page have not been evaluated by the FDA. This product is not intended to diagnose, treat, or cure any disease. ULTRA LUXURY DARK SPOT CORRECTOR - Our synergistic blend of natural and holistic botanical ingredients (DMAE, MSM, Hyaluronic Acid, Green Tea leaf extract et al) will leave your skin feeling brighter, hydrated and replenished! ALL IN ONE SOLUTION - This fountain of youth moisturizer and creamy serum helps collagen production, reduces fine lines, wrinkles and dark spots. Numerous Botanical Extracts offering full spectrum coverage of antioxidants, essential fatty acids for skin tone and texture. Improves hyperpigmentation & overall skin appearance with deep moisturization. PARABEN, CRUELTY FREE & MADE IN THE USA! - no dyes, parabens, or propylene glycol. We guarantee your satisfaction or your money back!